Trump's Conflict of Interest Gets Twitter Response From Government Watchdog : The Two-Way In an odd sequence of events, the federal ethics watchdog praised Trump in a series of snarky tweets for allegedly deciding to divest his businesses — something he hasn't specifically promised. It started Wednesday morning, when President-elect Donald Trump took to Twitter to address concerns about his ability to lead the U.S. government while also holding massive business interests around the world. "While I am not mandated to do this under the law, I feel it is visually important, as President, to in no way have a conflict of interest with my various businesses," Trump tweeted, adding that "legal documents are being crafted which take me completely out of business operations" and that he will be leaving his "great business in total." What exactly that means remains unclear. 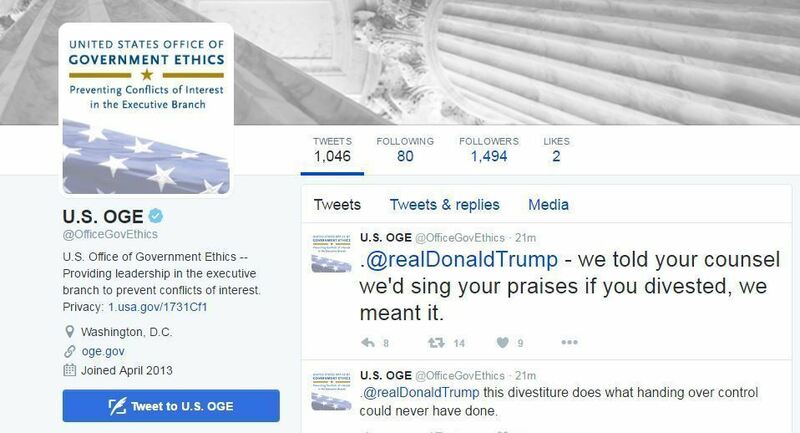 But the verified Twitter account of the typically decorous federal ethics office chimed in with statements that appeared to goad Trump about divesting his businesses — something he hasn't specifically promised to do. "Bravo! Only way to resolve these conflicts of interest is to divest . Good call!" the agency tweeted, mimicking Trump's own tweeting style. 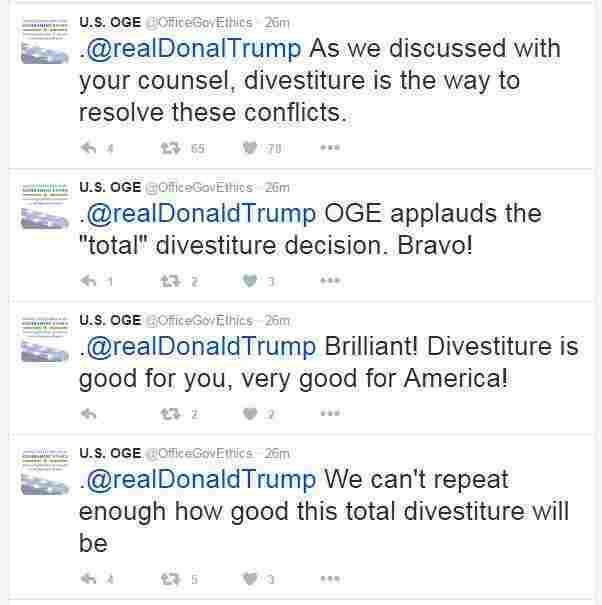 And: "OGE is delighted that you've decided to divest your businesses. Right decision!" And then things kept getting weirder. "Maybe the OGE has inadvertently leaked that Trump intends to sell off his assets, a dramatic move that the president-elect may have intended to save for his 'major news conference' Dec. 15. Maybe the tweets are a hacker's social-media joke. Or maybe an OGE official went rogue with the agency's social-media accounts, as a way to sarcastically poke at Trump or, having misread the news, cheer him on." But then, some hours later, the tweets returned — re-posted all over again, sending a new wave of confusion. "Like everyone else, we were excited this morning to read the President-elect's twitter feed indicating that he wants to be free of conflicts of interest. OGE applauds that goal, which is consistent with an opinion OGE issued in 1983. Divestiture resolves conflicts of interest in a way that transferring control does not. We don't know the details of their plan, but we are willing and eager to help them with it." The statement suggested that the tweets have been deliberate all along. And, in fact, the OGE later confirmed to NPR that this was not a hack. "Throughout his presidential campaign, Trump promised to turn the Trump Organization over to three of his children. But Don Jr., Eric and Ivanka Trump all remain close political advisers and members of his transition team, so it's hard to see how the Trump Organization and the Trump administration would remain separate, if that remains the case." "The tweets that OGE posted today were responding only to the public statement that the President-elect made on his Twitter feed about his plans regarding conflicts of interest. OGE's tweets were not based on any information about the President-elect's plans beyond what was shared on his Twitter feed. OGE is non-partisan and does not endorse any individual." The agency's officials still haven't answered why the tweets — if they were deliberate — initially were deleted. And more fundamentally, why did the usually straitlaced OGE decide to break character and publicly vocalize its opinion? Perhaps it's part of a new, Trump-inspired era of governing and social media. Big league!